Look at that beak–built like a nutcracker to crush the hard shells of sunflower seeds. 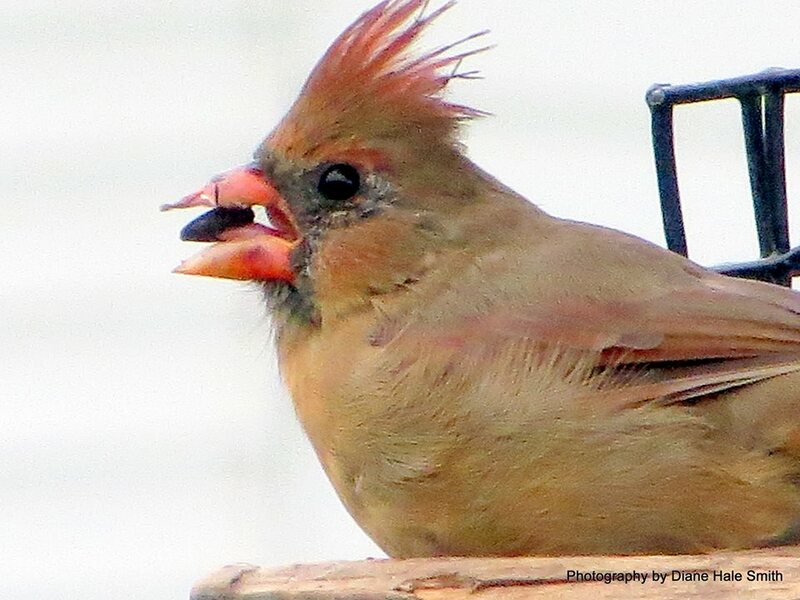 Cardinals love feeders as much as we love watching them. Their bright red plumage seems made for inept birdwatchers like me who can never spot the little brown birds hiding high up in the branches. Cardinals don’t flee the snow and cold, they hang around all winter, brightening up the drabbest months. It’s hard to imagine this tiny morsel of a bird surviving subzero temperatures, but look at that thick coat of feathers layered one on top of the other, like tiles on a roof. Under the colorful water-resistant outerwear is the underwear–fluffy down feathers, that can keep a cardinal warm even in January cold. Sunflower seeds are great high-energy food for winter, but cardinals also love berries–holly, Virginia creeper, small crabapples, even poison ivy. I try to encourage anything that has berries to grow around my yard as cardinal dessert.